BUY THIS BOOK. I have referenced this book in a couple in ‘New Rules’ previously. Ted co-authored with Tony Wagner to write the book Most Likely to Succeed: Preparing Our Kids for the Innovation Era. [I recommend both. Don’t tell me it can’t be done.] (Bill). Italicized words are directly from the book. Purpose—Students attack challenges they know to be important, that make their world better. Essentials—Students acquire the skill sets and mindsets needed in an increasingly innovative world. Agency—Students own their learning, becoming self-directed, intrinsically motivated adults. Knowledge—What students learn is deep and retained, enabling them to create, to make, to teach others. Here are a few overarching beliefs about today’s schools. Today, the purpose of U.S. education is to rank human potential, not develop it. “College ready” impedes learning and innovation in our K-12 schools. All students would benefit from considerably more hands-on learning. We can make education better and more equitable by challenging students with real-world problems. K-12 schools, done right, would produce graduates better prepared for life than most current college grads. Educators can transform schools at scale with change models that establish conditions, rather than mandate daily practice. Foreign education leaders said, “We get our best ideas from America. The difference is that we act on them, and you don’t.” Please, please, please consider the possibility that our innovative teachers, not data-driven policies, can best lead the way. Conventional Schools and Their Contexts: We visit the type of school most adults went to. Based on a century-old factory model, this particular school excels in preparing children for a world that no longer exists! It’s torn between two contexts: an education system anchored in the past and an innovative world defining the future. Real Gold amid Fool’s Gold: We’ll see stunning examples of classrooms where children love school as they develop purpose, essential competencies, agency, and deep knowledge. PEAK. The Ivory Tower: College can be transformational for young adults, but its model is broken. We’ll meet college leaders who are innovating in compelling ways and mavericks creating disruptive alternatives. Letting Go: Parents want the very best for their child, but their actions can be counterproductive. Against their genetic instincts, they need to let their child explore, discover, fail, and find their own success. Social Equity: In a country committed to opportunity for all, we give lip service to providing all children with an “equal education.” In today’s America, those who need the most get the least, and vice versa. This has dire consequences. Doing (Obsolete) Things Better: For decades, U.S. education policy has centered on trying to eke out tiny improvements from an antiquated model—”do things better.” We’ll understand why leaders gravitate to these policies and why these approaches are destined to fail. It Takes a Village: Innovation thrives when a community celebrates the aspirational goal of reimagining learning to elevate life prospects for its children. Most schools have a foot in two camps—its nineteenth-century education model and its twenty-first-century dynamic world. Professionals are finding it harder and harder to balance when being pulled in different directions. 5 million attend rural schools. Another half million go to charter high schools. A few hundred thousand are homeschooled. In 2002 No Child Left Behind (NCLB) came into law using test scores to determine success. In 2009 Race to the Top (RTTT) reinforced test scores being used as success indicators. We became the leader in standardized testing. Forty-two states allow for charter schools. After years of NCLB and RTTT standardized scores remain flat. WHY IS THAT, I ask the testing and policy advocates? See this website to follow some of Ted’s thoughts. www.EdLeader21. Here are a few examples of schools from the book. In Grand Rapids and Adrian, Michigan both had lots of dropouts. Ted talked to a shop teacher who brainstormed some ideas to keep kids in schools. The importance of leadership came up. Many schools would shoot down this idea, but their supportive principal said, “There will be obstacles. You may fail. But figure this out, and I’ll take care of the naysayers. Bill wants to meet this principal. In Austin, Texas—The motto is “Find a calling, change the world,” at Acton Academy in 2008. For two hours, Ted observed two dozen eight- to eleven-year-olds immersed in their learning. During this time, not one adult set foot in the classroom. Let me say that again. A group of young children were left alone in a classroom and spent two straight hours learning—on laptops, in small groups at a whiteboard, or in vibrant discussion groups. Emporia, Kansas – “No Child Left Inside” printed on the front [of the school]. We’re quick in America to express admiration for teachers, but we need to back that up in how we pay, trust, and honor them. If you come here, be sure to spend time on the knoll memorializing fallen teachers including those at Sandy Hook, who took bullets to save their students. Then ask, “If we trust teachers with the lives of our children, shouldn’t we trust them with a lesson plan? Every school has teachers itching to create knock-your-socks off learning experiences. [students] how they liked school, one said, “It depends on the day.” They loved their “hands-on” days; otherwise, they’d rather stay home—a perspective they shared, somewhat fearlessly, with Wyoming’s superintendent of public instruction. This was new information to me. It describes the difference between testing and learning. Consider Lawrenceville Academy, one of our nation’s elite private schools. Highly selective and expensive ($61,240 annually for boarding students), this school’s outstanding faculty teaches some of our nation’s highest-performing students, who then go on to our most elite colleges. A few years ago, Lawrenceville conducted an important experiment, something all schools should replicate. Students returning in September retook their final exams from three months earlier. To be precise, the faculty removed low-level material they didn’t expect students to retain over the summer. On tests of just the essential concepts, the average grade fell from a B+ to an F. Lawrenceville conducted this experiment for two years, with many students and several subjects. Not one student retained all of the essential concepts that the school expected every student to have mastered. This raises a vital question. Are even our highest-achieving students really learning? I wrote in other articles that David Perkins presented at a Learning Omnivores get together last March in Boston. He asked what is ‘learning worthy’ for students to learn? He also asked us ‘how do help students be ‘life ready?’ Dintersmith also talks about being life ready v. college ready. Buckminster Fuller: “You never change things by fighting the existing reality. To change something, build a new model that makes the existing model obsolete.” So, don’t you think it is time to reimagine schools to prepare students to be life ready? Especially those students who are not doing well in school or not coming to school at all. Here are a few examples of college and universities that are changing the way they are preparing students. Stanford paints a vision of a different future (www.stanford.2025.com), where students pursue missions instead of majors as they cycle between on-campus study and real-world experience. Tempe, Arizona—Michael Crow, president of Arizona State University (ASU), is orchestrating? A consequential overhaul of a major four-year university’s history. He’s changed ASU from “a faculty-centered culture to a student-centered culture.” He asks the hard question of “Why are we here? ASU is about access, affordability, and student success. Crow gives his faculty high-level goals but trusts them as lead designers of the new ASU. Course designers understand that people learn by engaging in debate and interaction with others, not by passively watching a lecture. This insight escaped the horde of universities who jumped on the MOOC (Massive Open Online Course) bandwagon a couple of years ago, with disappointing results. U.S. Academy (USNAV ) Every night at midnight, we’d all meet in the ready room. called it learning by humility. We talked openly about what we did poorly, and the mistakes we made. I led by talking about what I had done wrong, setting the tone. Admiral Carter The USNA is all about leadership. All first-year middies address fundamental character questions: What are your distinctive skills traits? What shapes you from the outside? How will you become a leader of character? Most feedback comes from peers, reducing demands on faculty. Imagine if high schools took this approach to help students become leaders? If our goal is to close a gap measured by standardized tests, we should give up. These tests reflect the parent’s motivation, not the child’s. When I talked to people who think testing is the only way to go, I (Bill) tell them, ‘I am from Iowa.’ We have a saying, ‘the cow doesn’t get fatter by weighing it all the time’ FEED IT FOR CRYING OUT LOUD. While we are on the subject of Iowa, Ted visited a school in my home town. Iowa Big is a school where three districts combined resources in Cedar Rapids. I talked to Trace Pickering at the school prior to reading this book. Business people committed a day to follow a student for a whole day. They found school was boring, subjects were in silos and not connected, and students were assigned fake work (not related to work done in business). One more thing, the business people thought students should give something back to the community. They have been operating for over five years and student requests continue to grow. All students have to do a presentation on their community project. They are doing PBL, community projects, internships, etc. They have two schools using space above existing businesses. I want to visit if I can arrange my schedule. Maybe during my high school reunion in August. Based on my (Ted) travels, I believe that the purpose of school today in America is to rank potential, not develop it. Worse, schools rank potential on the basis of inconsequential proficiencies, in ways that provide an outsized advantage to the affluent. No Significant Differences between Charter and Public. Source: Stanford CREDO 2013 Report. Machine intelligence isn’t going to wait for us to resolve education infighting. Find ways to let all schools innovate. Our education system spends billions of dollars collecting data precisely measuring student progress on material they’ll probably never use. How many of you who took Calculus, use Calculus? This is what inspired me to write a ‘New Rule’ Do it for OSCAR. Oscar said “I read in history class about how adults in our country worked together long ago to put someone on the moon. Do you think adults can work together to make our schools great?” For my (Bill) money, Oscar is more insightful than many legislators. I want the legislators to take the tests they require the students to take. I want their scores published in the paper so I can see how they stack up. Oh, and we should grade them too. In education, our experts know what to do. The problem is, we listen to the wrong experts. Our innovative teachers, not those at the top of the education pyramid, are the ones who know. They’re creating classrooms where children thrive, where students are building purpose, essential skills, agency, and authentic knowledge. I think following Al Shanker’s original vision would make major improvements in schools. Get real teachers, who have some good ideas, let them implement them, and learn more effective ways to teach our kids. Our teachers can lead the way in transforming our schools, but they can’t do it alone. Schools won’t change from the top. They’ll change one classroom, one school, one district at a time. And local change is achievable change. Changing schools is hard work and there is no perfect template. 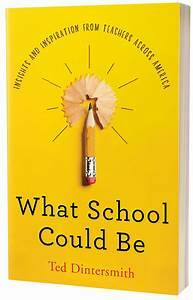 You will see the diversity of ideas and schools as you read this book. H.G. Wells said, “Civilization is in a race between education and catastrophe. Let us learn the truth and spread it as far and wide as our circumstances allow. For the truth is the greatest weapon we have.” I, Bill, vote for education not waiting for the catastrophe. Thank you, Ted, for amassing such great information, saving educators time, and providing some wonderful ideas to help staff and students learn. Let’s use this to do better for kids. Ted closes with this quote. Oscar, don’t give up on us. I love this. It touches my soul as a learner, a teacher, a parent, and a human being.